The concept for a revolutionary new wave energy device that sits on rather than in the water has been validated at the Australian Maritime College. Engineering solutions company AMOG used AMC’s towing tank and model test basin to test 1:30 and 1:40 scale models of its concept, with the results informing the next phase of testing and commercialisation of the technology. Hayden Marcollo, Director of AMOG Technologies, explained that the model testing program was an important part of understanding the concept’s energy potential and survivability in extreme conditions. His team had already carried out numerical analysis on the concept but needed the physical model test program to help validate the results from the software. “Testing at AMC demonstrated that our numerical models were working well and gave us a calibration point to help us fine-tune our numerical models and predict how much power could be generated from a full-scale device,” Mr Marcollo said. The AMOG device sits on a boat and can be towed out like a normal boat and moored on anchors – negating the need for specialist drilling rigs to install the device. "AMC is instrumental in providing the expertise and facilities to help us commercialise the technology. The converter has been developed from a group of experienced offshore oil and gas engineers turning their hand at wave energy," Project Manager Jon Gumley said. Over the years AMOG worked in the renewable energy industry, they saw complex devices that suffered from reliability problems, said Mr Marcollo. The AMOG device is based on the principle of dynamic vibration absorption, more commonly found on tall buildings, whereby a mass is attached to a moving or vibrating structure to dissipate its energy. Mr Marcollo and his team turned to AMC because of the quality of the facilities and the expert support on-hand for the testing program. The AMC facilities are the best in Australia and, importantly, AMC does a lot of scale model testing. This was vital to us because you can go somewhere that has a wave tank, but it’s the experience of the people at AMC, and the familiarity they have with our methods and concepts, that really adds value to the project. AMOG are now developing a 1:3 scale model based on the calibrations obtained from their AMC testing and are preparing for a two to three month field test off the coast of Cornwall, UK. A full-scale test would follow, and the concept could be commercialised – and could find application in Australia – in around three years, said Mr Marcollo. “AMC is instrumental in providing the expertise and facilities to help us to commercialise the technology,” he said. 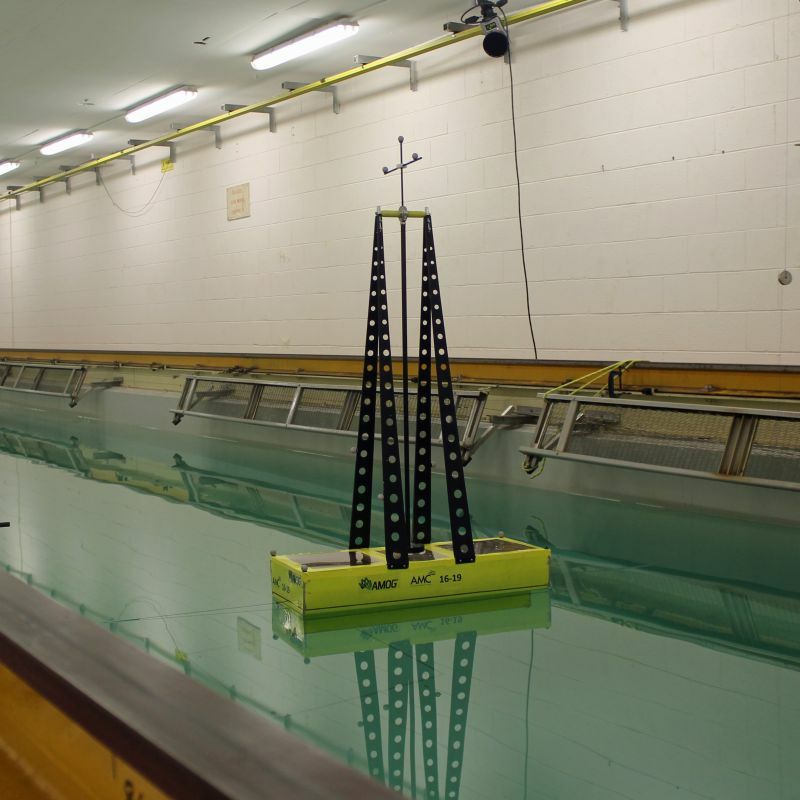 (Pictured): The AMOG wave energy device model being tested in the towing tank.